Over Thanksgiving, I began learning how to make candles with the intention of making them as gifts for the women in my family at Christmas. I was using a soy/parrafin wax blend and some 8oz hexagon jars with silver screw on lids. I purchased 3 wintery fragrance oils from Brambleberry, one of my favorite soap making supply sites. The first scent was called “Fresh Snow” and gave off a somewhat soapy or Downy fabric softener smell so I decided to use light blue dye for those ones. The second scent was “Santa’s Spruce” which was supposed to be Christmas Tree scented, but had a hint of berry and was making me feel ill when the whole house was filled with the smell. 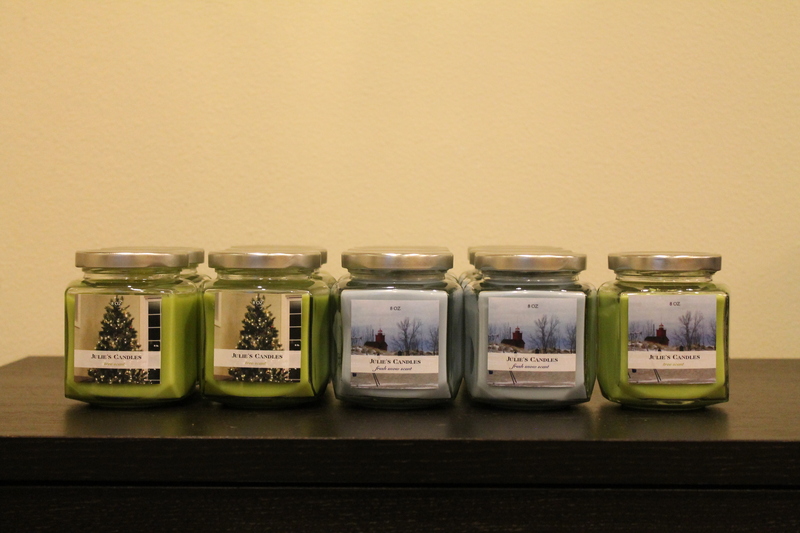 The third scent was another Christmas Tree scent that I liked a little better but was also overwhelming when my whole house was filled with it. I used a bayberry dye chip for each of those. The thing that gave me the most trouble was sink holes next to the wick. The first two turned out perfectly, then the next few batches all had this problem. I first tried to re-melt them in a pot of water on the stove, but when they cooled I had the same issue. Then I re-heated some of the extra wax and poured it in the giant space left next to the wick, and that worked okay. After doing some research online, I realized that the problem was likely how high I was pouring the wax. The suggestion was to not pour past the point where the shape of the jar changes. For the last four I made, this solved the problem. I wish I had discovered that earlier in the process, because re-melting and re-pouring everything was a pain and took way more time that it should have. In the end, I think they turned out pretty well. (I purchased custom labels online and used a photo that I had taken.) I hope everyone enjoys them! I decided to try candle making over Thanksgiving with mild success on my first attempt. I’m hoping to give these away as gifts at Christmas using some holiday themed fragrances and colors, but wanted to do a test run before using the supplies for the gift ones. 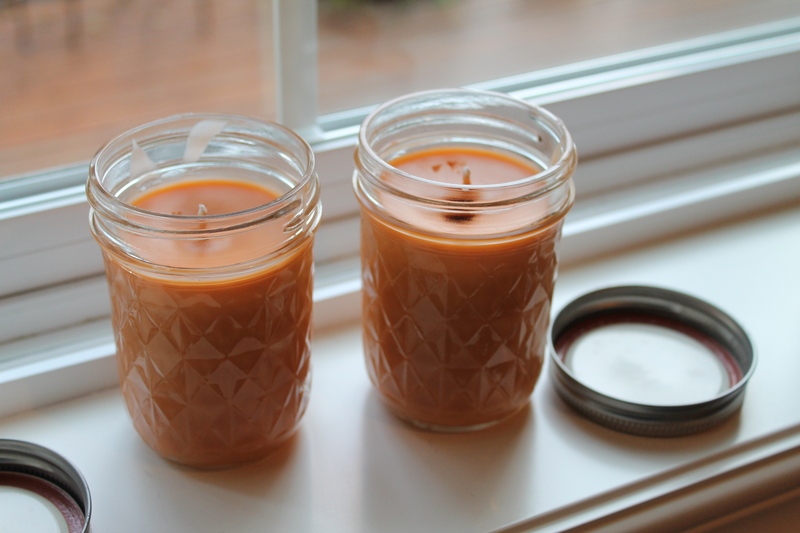 Last night I made these two pumpkin pie scented candles using a paraffin/soy wax blend, amber color chips, pumpkin pie fragrance, and two 8oz mason jars. I started by attempting to use an eye dropped to secure the wicks to the bottom of the jar as I had read about online with very little success. Then after melting and mixing up the wax, fragrance and dye chips, I poured the wax into the containers and used popsicle sticks to try to hold the wicks in place at the top. Unfortunately this didn’t work very well, and one of them moved after it had started cooling and left a large empty space where the wick had been. Based on this experience I ordered some wick stickers and wick bars to use next time, so I don’t have the same problem. I thought I could get away without them, but it is much harder then it looks. My whole house was filled with the scent of pumpkin pie after mixing up the wax, so I’ll have to remember to do one fragrance at a time. I suspect a mixture of the scents would not be very pleasant.